Selecting appropriate measures of center and variability in order to summarize the important features of a set of data. Using quantitative measures to justify an argument. Before the lesson, students work individually on an assessment task, Getting James to Work, designed to reveal their current understanding and difficulties. You review their solutions and create questions for them to answer in order to improve their work. The lesson begins with a whole-class introduction in which students review important terms. Students work in small groups on a collaborative task creating data to satisfy written descriptions. When they have constructed their data sets, they separate their data from the descriptive text and pass the data to students in another group, who have not worked with the data to construct a description of their own. The two descriptions are then compared. In a whole-class discussion students review their approaches and what they have learned. In a follow-up lesson, students receive your comments on the assessment task and use these to attempt another task, approaching it with insights that they have gained from the lesson. Each student will need a copy of the assessment tasks Getting James to Work and Running Times, a mini-whiteboard, pen, and eraser. Each small group of students will need either the sheet Getting Raj to Work (1) or the sheet Getting Raj to Work (2), blank paper, calculators, and a pair of scissors. 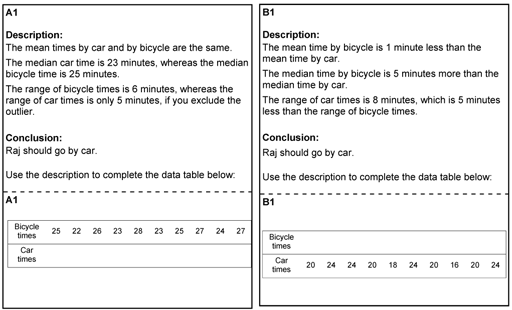 Extension tasks Getting Raj to Work – Extension (1)/(2) are also available for use after the lesson if desired. 20 minutes before the lesson, a 110-minute lesson (or two shorter lessons), and 30 minutes in a follow-up lesson. Timings given are approximate and will depend on the needs of your class.